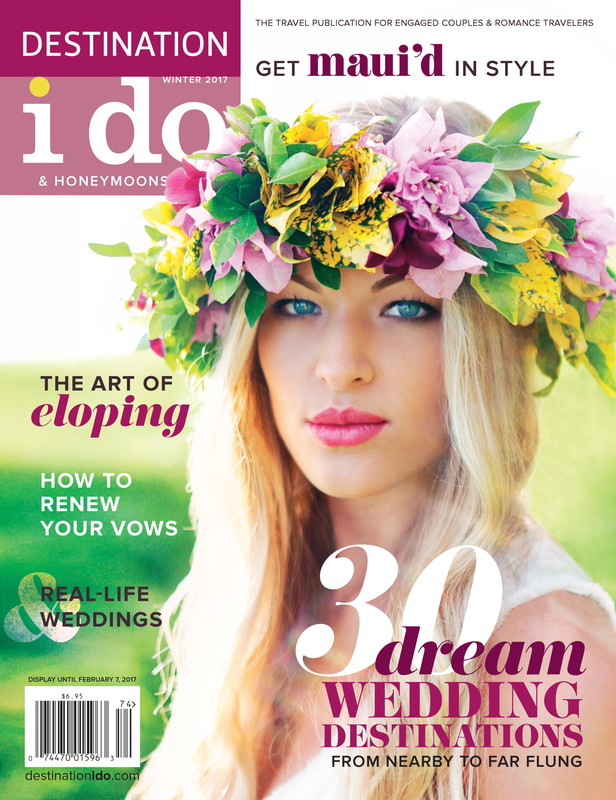 Whether you’re recently engaged, researching honeymoon locations or looking to rekindle the flame of love with a romantic trip, Destination I Do’s Winter 2017 issue might just be an indispensible resource. Our roving editors and contributing writers set foot on four continents to create well-rounded recommendations. Unlike anywhere else in the U.S., Hawaii grants you a true taste of the tropics. It brings forth mental images of crashing waves, tall swaying palms, velvety green mountains, stunning sunsets and rainbows streaking across the sky. A group of extremely talented vendors took inspiration from the island to create this photo shoot for us and, not surprisingly, one of the images was chosen to grace our winter cover. Our bride is ready for her close-up with a dramatic haku floral crown by Jackson Durham, beachy waves by Vera Joyce Hair Studio and glowing makup by Ry-n Shimabuku. She's wearing the "Asha" silk tank by Wtoo by Watters & Watters.